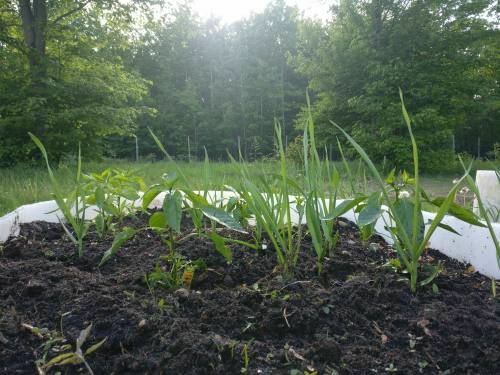 Peppers planted with garlic in raised beds. Tomatoes planted with squash in raised beds. Tomatoes, peppers and squash planted together in a raised bed. Soon we will be creating a garden layout and planting our produce. Companion planting might be a way to help you make a decision on how to design your layouts. It can be used in both small-scale gardening and larger agriculture field layouts. It is a common technique used in permaculture and square foot gardening. So, what is companion planting? Companion planting is the planting of two or more plants in proximity so that they can benefit each other. These benefits can range from increasing crop production, pest control, providing habitat for beneficial insects, and maximizing your space to its fullest potential. Some techniques or practices of companion cropping include the three sisters, intercropping and trap cropping. Companion planting can also help you to understand what plants should not be planted next to each other. For example, plants with similar diseases should be separated, like potatoes and tomatoes who suffer from the same blight. Peppers and beans should also be separated because they are both prone to anthracnose. Some plants can also hinder the growth of other plants. Onions can give off a chemical compound that beans do not like, so they should not be planted close together. When you only have a small garden, maximizing your space is important. 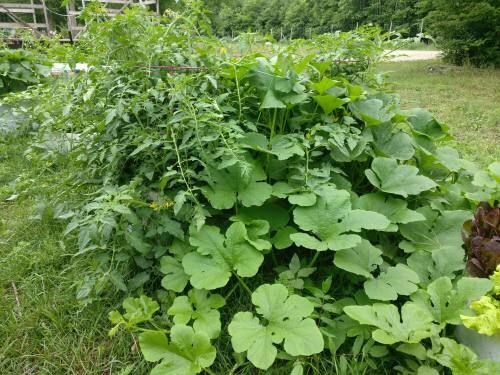 Companion planting can do this by allowing two crops in the same space. Putting a fast-growing plant together with a slow-growing plant may be a way to maximize the yields for that space. An example of this would be lettuces and squash. The lettuces can be harvested as the squash are just starting to take off. Companion planting can provide habitat and food for beneficial insects. For example, planting flowers around your garden that bloom all summer to give bees a food source. This, in turn, will benefit other fruits and vegetable, making sure pollinators are there when needed. Chamomile can also be planted in your garden to attracts hoverflies and parasitic wasps that prey on garden pests. Many plants have the power to repel garden pest, acting as a form of pest control. For example, planting rosemary with your carrots to repel carrot flies. One other example would be to plant tomatoes with asparagus to repel asparagus beetles. Companion planning overall will increase crop production. By utilizing the space better, the yield for that space will go up naturally. Creating habitat and food for beneficial insects will bring pollinators and natural predators for the pest into your garden. This will create higher yields and better-quality crops. Using plants to repel pest will limit crop loss due to those pests. The benefits of companion planning combine to contribute to better yields and production. One of the most commonly known companion plantings is the three sisters. It is a technique of planting three companion plants together. It consists of climbing beans, corn and squash. Originally planted in Mexico and used by the Native Americans. The three crops work together to benefit each other. The beans provide nitrogen to the soil and help to support the corn. The corn gives the beans a place to climb. The squash provides shade to the soil and stops some of the moisture from evaporating from the surface with its large leaves. The squash also helps with weed control. Intercropping is when two or more crops are planted in the same field. Most of the time the purpose is to produce the greatest yield overall on that piece of land. This practice of companion planting is commonly done in larger fields. For example, strip cropping corn and hay in the same field. This can help strengthen the soil by preventing erosion and creating natural dams for water. Trap cropping uses a plant to attract agricultural pests away from the main crop. This practice works best on smaller scales, such as greenhouse and gardens. In large fields the trap plant has a harder time pulling the pest away from the main crop. A great example is alfalfa planted in strips with cotton. The alfalfa helps to draw away Lygus bugs from the cotton. Alfalfa and mustard can also be used to do the same for strawberries. Companion planting could be a benefit to your garden and is something to consider. There are many different combinations of companion plants, only a few have been presented above. So, don’t be afraid to do a little search online to find companion planting charts and have fun on your garden adventures. Tiffany Jones is the District Manager for the Wexford Conservation District. For more information on companion planting and for assistance in local conservation matters, contact Tiffany by phone at (231) 775-7681, ext. 3, by email at wexford@macd.org, or stop by the Wexford Conservation District office at 7192 East 34 (Boon) Road, Cadillac.